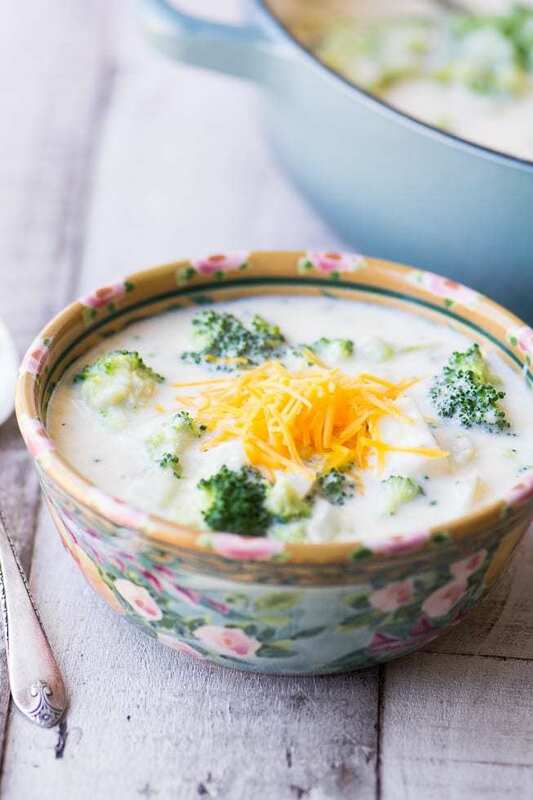 Creamy Broccoli Cheddar Cheese Chowder is comfort food at its finest...made from scratch quickly and easily in 30 minutes. Melt the butter in a stock pot and saute the onions and chopped broccoli stems for about 7 minutes until softened but not browned. Meanwhile put the potatoes, bay leaves, cumin seeds and sage in a saucepan and cover with water. Bring to a boil and simmer until tender, about 6-8 minutes. Don't over cook them. Add the flour to the onions and cook, stirring, for one minute. Add the wine to the pan and stir to combine everything. Stir in the half and half and chicken stock. Add the potatoes and 1 1/2 cups of their cooking water, along with the broccoli. Bring everything up to a simmer and cook gently for about 15 minutes. Season with salt and pepper to taste. Remove from heat and slowly stir in the cheese. Stir until the cheese is melted and the soup is smooth. Ladle into bowls and serve with some additional cheese for garnish.